This contemporary two-storey residence located in Bangkok, Thailand, was designed in 2017 by Openbox Architects. 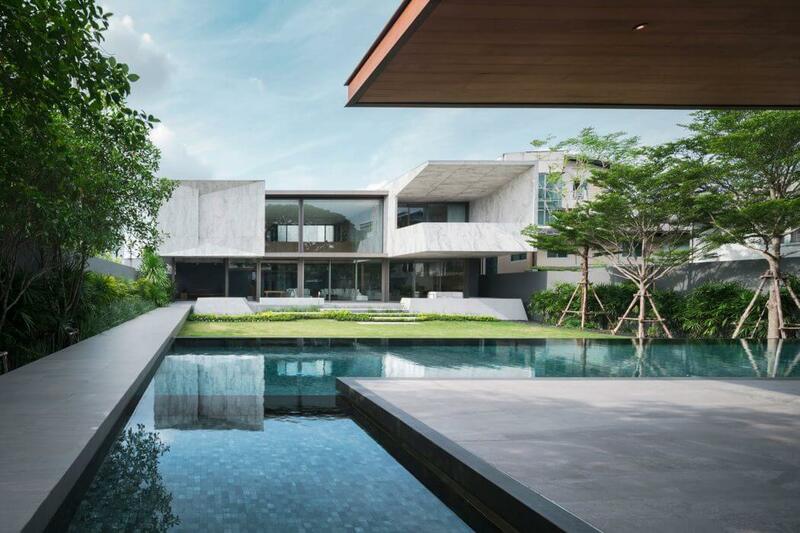 OPENBOX Architects (OPNBX) has been founded in 2004 by NUI Ratiwat Suwannatrai and PRANG Wannaporn Suwannatrai, architect and landscape architect / husband and wife. The design studio has been formed, based on the core belief that architecture and landscape should be designed and perceived as one. For the past decade, OPNBX has been involved in numerous projects of various types, that illustrate the importance of unified concept, boldness and harmony between architectures and their surroundings. OPENBOX Studio has currently expanded our service scope to cover architecture, landscape and interior to emphasize the power of unified design concept. Boundaries between each aspect blur into one another, allowing us to create unique Identity Design for our recent projects.